I find everything Yuval Levin writes worth reading. His commentary is always measured, well-reasoned, and insightful, taking the long view of even the most contentious political issues. He is easily one of the best writers at National Review. I’m not Catholic, I’m Jewish, so you should certainly take my reading of papal documents with a healthy dose of kosher salt. But for what it’s worth, the kerfuffle over Pope Francis’s recent encyclical on (among other things) the environment seems to me to point to some interesting tensions at the heart of modern environmentalism. A lot of critical interpretations of the encyclical have treated it as abusing the Pope’s standing and authority (in the eyes of Catholics and others) to advance a left-wing or radical environmentalist political agenda by dressing it up as Catholic doctrine. Having finally read the encyclical, I’m left thinking roughly the opposite is the case. The Pope is trying to hijack the standing and authority (in the eyes of global elites and others) of a left-wing or radical environmentalist agenda to advance a deeply traditional Catholic vision of the human good and to get it a hearing by dressing it up as enlightened ecology. Read the whole thing here. And don’t forget to read the actual encyclical, either. Maybe all week, all year … maybe your whole life. In keeping to the old prisoner/work relief thread running through this blog, I refer you to theThe Marshall Project’s interview with Anthony Ray Hinton, convicted of murdering two fast food managers in Birmingham in 1985. 29 years old at the time, Hinton was sent to death row. 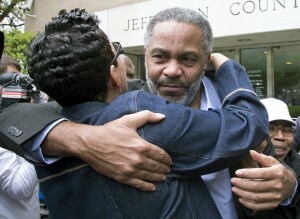 He was released last week after spending 30 years there, much of it in solitary confinement. In solitary confinement, a lot of people break up. They lose their mind, they give up, they commit suicide. Tell me about your experience. How you were able to hold onto yourself? I come from a Christian background. My mom was strict. She always would instill in us that we don’t need anybody to actually play with. Get outside and play by yourself. She taught me to lean on Jesus and no one else. And when I got to death row, believe it or not, I witnessed people hanging. I seen people cut their wrist. I seen blood leaking from under the cell. I seen men who hung themselves. And so I became a person that got wrapped up in my sense of humor, and I tried to make everybody that I came in contact with — from prison guard to the wardens to the inmates — I tried to make everybody laugh. I would see a guard come by and I would say, “Hey officer.” He’d say, “Yeah Anthony, what can I do for you?” I’d say, “I need to run to the house for about an hour, and I’m gonna need to use your car. I’ll bring it right back, but I need to go.” And they would laugh. You have to understand something: These crooked D.A.s and police officers and racist people had lied on me and convicted me of a horrible crime for something I didn’t do. They stole my 30s, they stole my 40s, they stole my 50s. I could not afford to give them my soul. I couldn’t give them me. I had to hold onto that, and the only thing that kept me from losing my mind was my sense of humor. There’s no man who’s able to go in a cell by yourself, and you’re there for 23, sometimes 24 hours a day, and you don’t come out. There’s not a human being that can withstand that pressure unless there’s something greater inside of him. And the spirit was in me where I didn’t have to worry about killing myself. I’d be lying if I didn’t say that Satan didn’t come up on me and tell me, Well you ain’t never gonna get out of here. When I saw people going to be executed, every man in there would tell you he questions himself — is that ever going to happen to me? And when that little voice comes and says, Well they’re going to get you the next time, I would immediately tell him to get thee behind me, and I would turn on that switch of laughter. And I didn’t ever turn it off. To this day, even though I’m free, I still haven’t turned that sense of humor off. If you could have seen me in those 30 years, you would have said this guy can’t be human. This guy is crazy. This guy laughs and plays like he ain’t on death row. I didn’t accept the death penalty. You can’t make me take the death penalty. You can give it to me, but you can’t make me take it in my heart. There’s a whole lot more—about the day his mom died, about what it was like to use a fork for the first time in three decades, and the importance of Mark 11:24. Which you don’t have to be in prison to appreciate. It’s there for everybody, and it’s there for you, too.